Al, the four-year-old with the mostest, had dug out the household collection of wooden swords. He had also requisitioned the dog’s revolver and a kalashnikov-type foam sucker gun. His armoury was impressive. Felix, my eight year old son, took one look at it all and suggested a game of hide and seek. Al is besotted with combat right now. If he chooses a car, it’s a car with some hammer attachment which can pulverise things; listen in on his car conversations and the cars are stirring it up prior to some heavy street brawling. A spoon can become a gun in an instant. The cat looks up from a nap to find herself at sword point. My pasta preparation has been conducted under military surveillance. Because somewhere in his little psyche he’s hard at work, sorting out good and evil. In the red corner: the baddies. Those heinous no-good types who are out to conquer all. And in the blue corner: the goodies, the defenders of decency, the bastions of beauty. Right now the evil villains have it. In all Al’s role play he’s feeling what it’s like to be really, anarchically violent. Al’s mummy is scrupulous at home. He watches lovely preschool programmes scheduled by the BBC. His sisters are dolly-lovers, and even Felix prefers these days to create fantastical lego constructions than go conquering. Al’s investigations are all his own. Does Al sense his mother and his aunt’s uneasiness with the whole shoot-em-up gung ho thing? Or is he just researching, thoroughly, the diktats of his amygdala, the fight-or-flight caveman part of his brain? Al began to unravel the puzzle for me when he swept into the kitchen with Felix’s wooden sword, like one of my favourite sculptures. He looked for all the world like The Avenger. Have you ever seen him? A breathtaking sculpture by Ernst Barlach which hurtles, unmoving, through a gallery in the Tate Modern? He is bent forward, intent, at great speed, his great cloak like some wizard’s, furling out behind him. And in his hand, clutched close like a Samurai ready to strike, is a great sword. It is as if this weapon is living, a compatriot in the speed and intensity of the moment. It is all that is seductive about retribution. For me, a female who never experienced the mammoth-slayer’s ire, it is a window onto something. Barlach made it in mid-life, as the First World War approached. He rejects detail and frippery and centres on the polarised moment just before a strike. The lines are clean. The situation has no ambiguity. It is simple: revenge is his. He had watched Germany suffer, had watch it descend into poverty and chaos. It was as if, by going to war, a great clean sweep could be made with that great sword and Germany would be avenged. All would be well again. There would be a new artistic age. He enlisted as an infantry soldier in 1915. And he saw, at close hand, what weaponry could really do. It needs no description of the horror and pointless loss of life in the trenches to explain why the man who had created this consummate piece, epitomising play-fighting, came back a confirmed pacifist. In the years between the wars, the people of the city of Magdeburg asked him to create a glorious memorial to their men who had died in the first world war. Barlach stirred huge controversy with his creation. 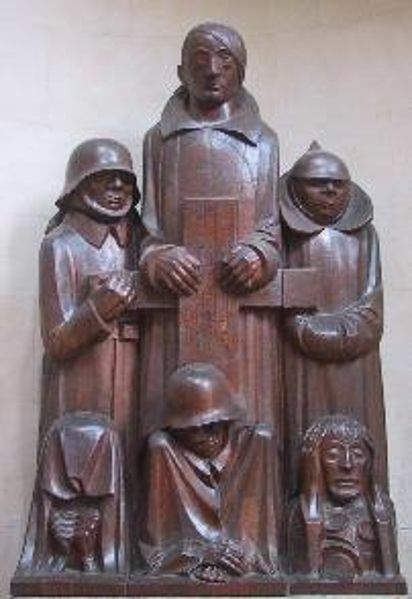 The Magdeburg Cenotaph, created in 1929, speaks of the reality of war. A great tombstone rises in the centre: and by it stand three German soldiers: a young recruit, an officer and an old reservist. Beneath the stone are figures: an old mother, mourning her son; Death clad in a German helmet; and there he mourns, Barlach himself, beside Death. There is much research out there about boys and guns and play-fighting. And I sense that however we try to surpress The Avenger, the dream of him will continue to shadow men and boys alike. For Barlach, the dream stopped abruptly when the reality set in. The need to learn empirically is one of the greatest tragedies in human nature: second-hand sermons reek of syrup for youngsters with the taste for adventure. And so, when Al is much older, I shall take him to the Tate Modern, and show him The Avenger: and maybe we could take a trip to Magdeburg to see the Cenotaph. I am not sure words are the best tool to show how true violence can change a man. Posted in UncategorizedTagged boys, Ernst Barlach, guns. weapons, The Avenger, the Magdeburg Cenotaph, war. world war oneBookmark the permalink. How wise to recognize that aspect of the male psyche. I sometimes wonder what it took for those who do become pacifists. Is is horror like war, or a maturing where logic takes control? I looked as the statue. Very Gothic. I am surprised it survived Hitler’s 1930’s Germany and supposed he was repressed by the government as was Herman Hesse and others in the arts. Thank you. It is a new angle, looking after a preschooler at gunpoint. I too was riveted by the Tate statue, Kate. Carved into its face is truth. Most boys I’ve known go through a shoot-em-up phase at some point or another. I think my friend Melissa’s boys (they are six) calmed down when they took some martial arts lessons and realized all that activity could mean one of them got hurt. And, getting hurt isn’t fun, which takes the shine off hurting others. Love, love, love the new theme!! It’s the perfect irresistible red dress in the window. Also, I have to make changes to the end of the book, in case you started it. I know your life is crazy, so it will be fine to hold off. Oh, PANTS 😀 Serves me right for trying to complete a blog with kids swarming all over me. You are quite correct, IE, I meant to say Art Nouveau. Reference removed. Although to me, the Avenger rests somewhere between the two with his minimalist, concentrated style. There is something very modern about him. Hmmm. Could this soldier be who we suspect he is? He became chancellor in ’33, but was very active and would have been a symbol for a WW1 soldier with dignity, who refuses to lie down and be forgotten….maybe someone out there knows for sure…. Despite all of my pacifist inclinations and preachings, my boys went through the weapons deal. I couldn’t believe how they would make triggers of twigs and swords of clothing hangers. Honestly, it’s sort of in the DNA or the water? I reckon DNA, Tammy. The mammoth-slayer’s still in there somewhere. Very moving. I often find myself staring at the names on the memorials in every tiny village around us in the Vendee. Sometimes there are only two names and often I will know of someone with that name. The cost of those wars was heartbreaking, Roger. Losing someone that way: to me it seems unbearable. The age old question of nature vs. nurture . . . even with his mom’s filters firmly in place, Al is apt to have picked up some inkling of “video violence” from his peers. It is impossible to raise the next generation free from the influence of this generation. Love the look of your new blog theme, Kate! Thanks Nancy 🙂 I wandered past it in a shop window and just had to have it. Now I need to make it do what I want. Pic sizes are all wrong….it’s off to work we go…. LIttle boys can turn to weapons no matter what adults around them do. I’ll never forget a frustrated friend who monitored what her little guy watched and did, coming in to school, exasperated that he had managed to whittle a gun – our of his peanut butter and jelly sandwich. I love you your new, Kate. Gives me pause to think about giving my blog a facelift. A peanut butter and jelly sandwich…I heard it all now, Penny 😀 That is determination. Felix is going through the same fascination just now, and while we have few actual replicas of weapons in house, he can and does imagine them out of anything, including thin air if needs be. It happened with my other boys too, as they came through this age of moral investigation. Those two (and their actual parents) all made it out house and limb intact, so I have great hopes for Felix as well. And a new thing to find when I get back to England. The Tate Modern…just next to the Globe too, and the MIllennium Bridge, and St Pauls… that and a packed lunch: could there be anything nicer, Cameron? Dear Kate, . . . I went to Goggle to see the Barlack sculpture and found a photo of it at the Detroit Institute of Art. Did he do two “Avengers” or is this on loan from the Tate? As to boys and guns, I think you probably have it right about the male psyche. And I’m pretty sure that most of us learn best by experience. Although I will say that I began reading adult novels in the fifth grade and I’m sure also that they influenced my understanding of the human condition. Yet it’s in the trenches of our own lives that we learn the possibilities and the tragedy and yes, ecstasy, of being human. If only we could learn–all of us–to be mindful of our experiences and to reflect on them. That’s part of what we need to teach our children–at home and in the classroom. Peace. This is really interesting, Dee: it’s possible it’s gone on loan but the blog I found had Barlach’s masterpiece in the Detroit Museum in July 2011, which is precisely when we would have gone to see it. I wonder if he cast two? Think it’s in bronze….might email the Detroit Institute to ask…thanks Dee! Mindfulness is so important but it’s part of wisdom: a thing we gravitate towards if we want to. If it’s not high on our list we can disregard it completely. The energy in The Avenger portrays youthful idealism. That’s a tough nut to crack and does not sit easily with wisdom, does it? And spray you do…threads abound. Great new look, Kate. The grandson of a friend, raised by a dynamite, yoga-studio-owner mom who was a graduate of Women’s Studies and given dolls and trucks as toys, has grown into a true companion for Al. I’m not sure which household would be able to endure if the two of them connected. My friend cannot resist a quiet giggle about it. 😀 He sounds fantastic, Amy. High energy: but fantastic. To kiss a dog, or not to kiss a dog?